Burnished steel, or gun-metal, has a much darker finish than the other metals (think blackened/burnt finish, like wrought iron). It is made in either the formed base, or the standard base before being lacquered for protection. 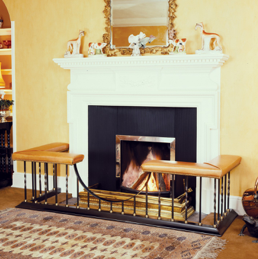 Uprights are available in plain round, plain square, central twist in a square upright, which we usually alternate with plain square, and cage twists. The price of a burnished steel fender seat varies depending on which extras you have (eg, deep buttoned seats, twisted uprights) and the size, but expect a bottom line, including vat and delivery, of around £1092 for the formed base or £948 for the standard base. the formed base. 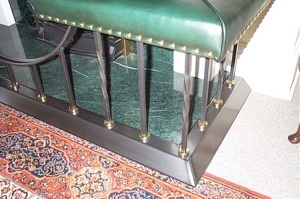 It has square uprights with alternating central twists, with round brass collars. 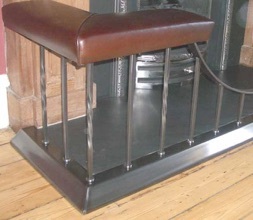 Click on the albums below to see examples of the burnished steel fenders, and those with wood bases.